Choose the service that is right for you. 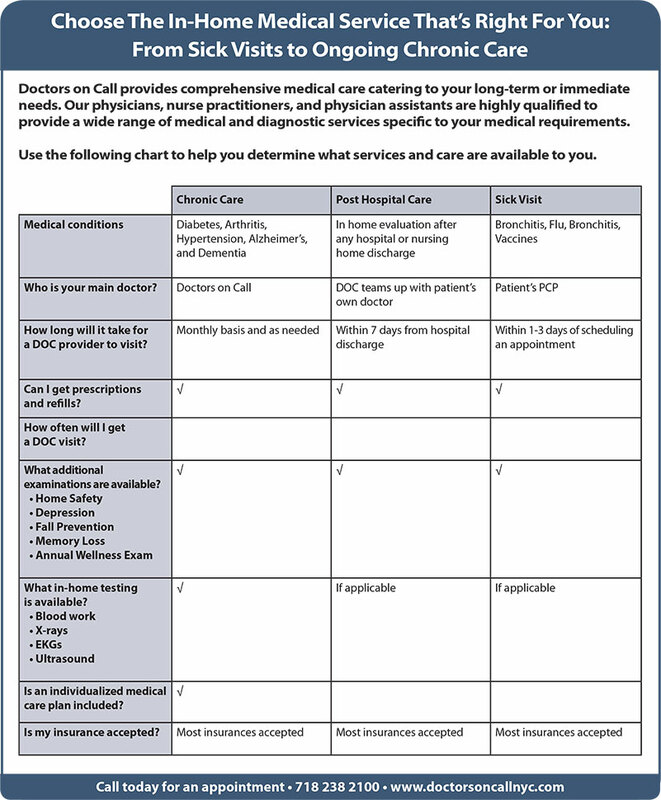 Doctors on Call provides comprehensive medical care catering to your long-term or immediate needs. Our physicians, nurse practitioners, and physician assistants are highly qualified to provide a wide range of medical and diagnostic services specific to your medical requirements. Do you or a family member suffer from diabetes, a heart condition, difficulty walking, or high blood pressure and are unable to get the doctor’s office? Have you recently been discharged from the hospital? Are you unable to get to your doctor to ensure your road to recovery and that all of your health care needs are being met? Do you feel that your blood pressure is too high, that your diabetes is out of control, or you’re generally under the weather, but are unable to get to the doctor?